Landscaper in Spartanburg - Cochran Landscape Management, Inc.
We carry a great sense of pride in the high quality work we deliver to our satisfied customers as the leading landscaper Spartanburg, South Carolina residents have experience working with. Since 2000, we have proven to be the leading landscaping company due to our extensive knowledge, expertise, and commitment to quality. Light up your life with us through our wide array of landscape lighting options. We have various styles for you to select from, including solar panel powered lighting and spotlights to low voltage and LED lights. Whether you’re looking for unique, sophisticated exterior decorating, setting the right mood for entertaining, or supplying your family with safe security lighting, we have everything you need for your vision to come alive. Other services we provide include lawn maintenance, irrigation system management, installation, and repair. We will be with you every step of the way, from our free estimate to the finishing touches of your project. 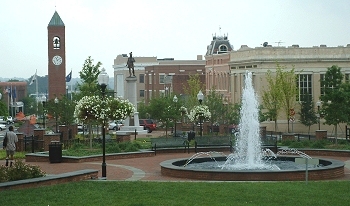 Spartanburg is the largest city in the state of South Carolina. With a municipal population of 37,013 and an urban population of 180,786, the city is known for its history and beautiful natural surroundings. Lawson’s Fork Creek, a tributary of the Pacolet River is full of wildlife and crystal clear waters. Parks and woodlands line its banks. With waterfalls and rocky shoals throughout its course, the tributary stretches from the northern end of the county to the eastern end, where it empties into the Pacolet. The Cottonwood Trail is a walking trail that runs along the creek. Hit the trails for a bike ride and enjoy a nice picnic after. Next, move on to the Hatcher Garden and Woodland Preserve, a beautiful haven for birds and other wildlife. Spartanburg is the ideal place to be for its developing remodeling of the city’s downtown district, including Morgan Square, restoration of many historic structures, and the relocation of many businesses and company headquarters. Some of these new developments include a Marriott Hotel, the headquarters of Advance America, QS/1 Data Systems, and the world headquarters of Denny’s restaurants. The city is also known as a college town, with eight institutions of higher learning. Also check out Spartanburg’s many events, including the Hub City Farmers’ Market, The Annual Sidewalk Arts Show, Spring Fling, The Greek Festival, The International Festival, and the Taste of the Backcountry. To stay updated on our work building retaining walls in Spartanburg, be sure to bookmark this page! A homeowner had cleared out a few trees with Cochran Landscaping that were getting overgrown, but once the trees were removed he felt like a sense of privacy was missing. The homeowner didn’t realize how much privacy the overgrown trees had provided for his backyard and he enjoyed being able to barbecue and spend time with his family without having people watching him. He asked the Cochran Landscaping team about installing a Spartanburg retaining wall that would enclose his yard nicely and provide a bit of privacy. The Cochran Landscaping team let the homeowner know that there are a variety of options that can be offered for retaining walls. The homeowner told the team what kind of budget he was wanting to do the wall with and the team went over some material options that would be perfect for the wall. The homeowner agreed and the team said they could start on in anytime he wanted, which the customer wanted the work to begin on Monday morning. The Cochran Landscaping team arrived at the Spartanburg home promptly on time and started working on the project. The team worked each day until the wall was built. The homeowner came home from work Wednesday afternoon and was thrilled with the wall that the Cochran Landscaping team had built for his yard. He started taking pictures of it, then posting it to his social media and letting everyone know that Cochran Landscaping is the retaining wall specialists Spartanburg residents can enjoy.